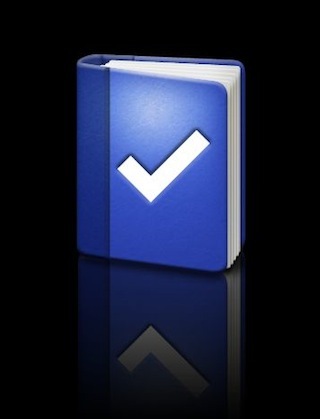 First thing to know is that ToDo for the iPad and iPhone have both been updated. They are seperate apps so you have to own both individually to enjoy across all of your iOS devices. The iPhone got High Rez Graphics for it’s Retina Display and Multitasking. The iPad version of ToDo 4 got a nice list of features that are noticable right away. Expecially for folks that asign due dates their ToDo items. Creating ToDo items and their basic tuning/settings hasn’t changed much. Adding a tag to an item is a feature we use a lot so we can track people or items across multiple projects. 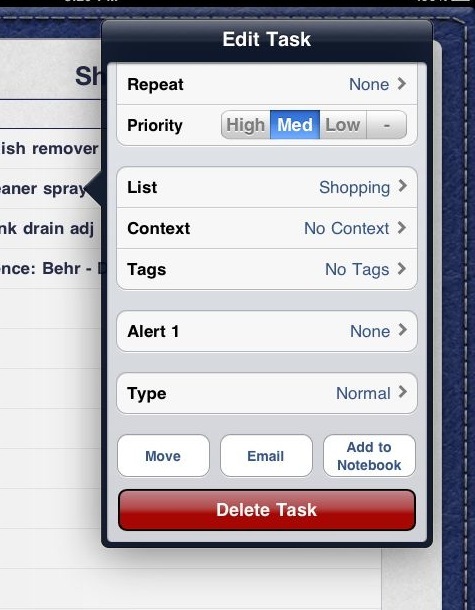 ToDo for iPad has always had the ability to change the characteristics of a list of items from Normal, Checklist or as a Project. This feature is often overlooked but when used will add considerably different thinking about your list of items. This same options list is a quick way to add additional information to a task. 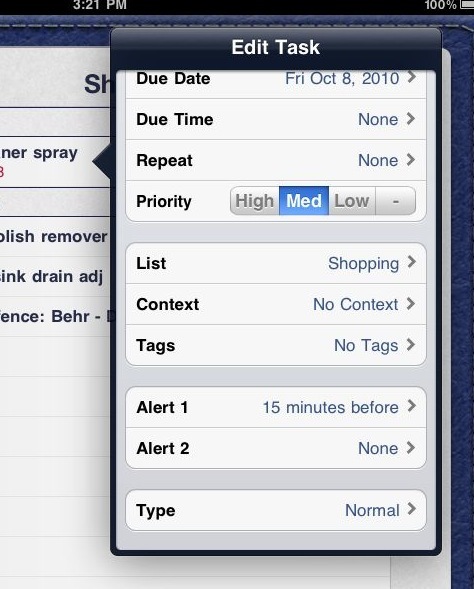 If a date is assigned to a Task/Line item, you can set an alert as well. 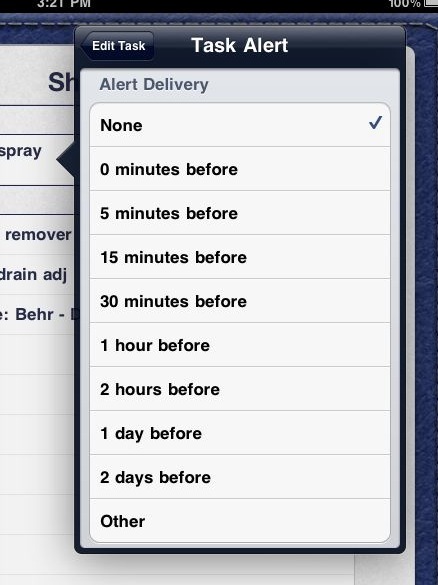 With ToDo 4, it is now possible to add multiple Alerts to a single task. Handy when you are counting down to a deadline or need additional assistance to complete the line item. Tapping on the left and right side of the pages flips either the overview tab into place or takes you deeper into the list. 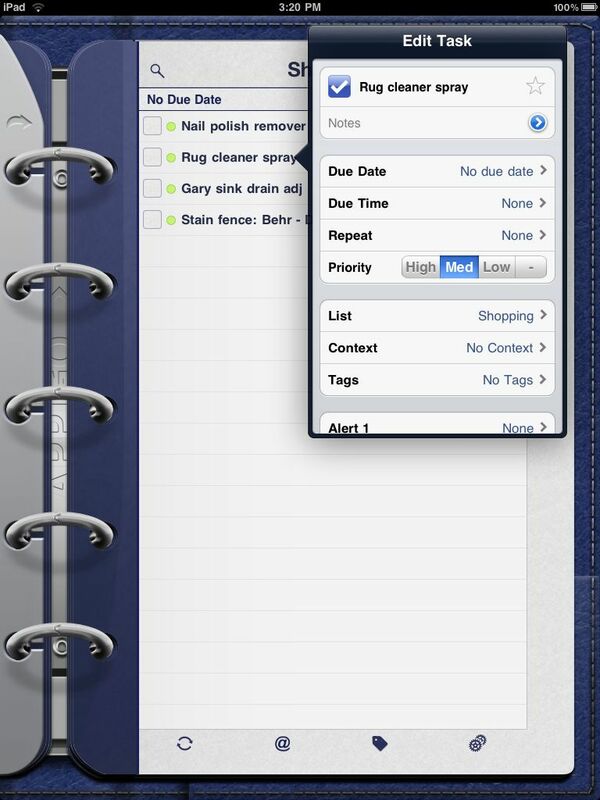 Here the overview shows the Todo lists and a highlighted ‘1’ to show an item is past it’s due date. In ToDo 4 for iPad (and iPhone) the past due date number is carried out to the overall application launcher window so you do not have to have the app open to know your behind. 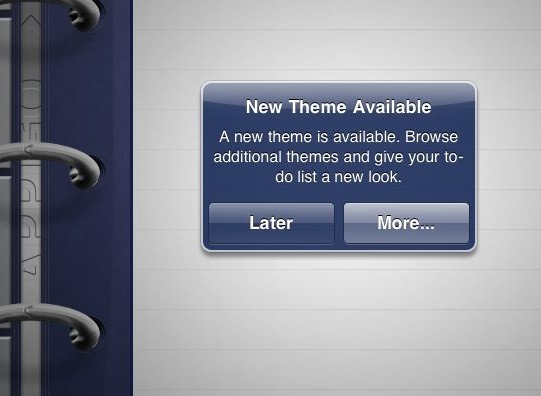 An undocumented feature that popped up while using the new ToDo 4 was the app up-selling us to buy more Themes. 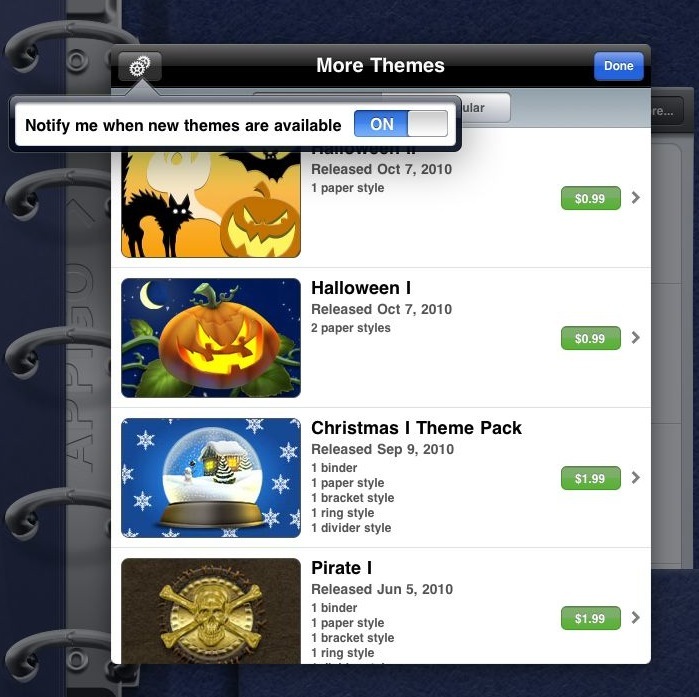 Themes is one of the items that has set ToDo for iPad apart from many of the other options. The ones loaded with the app are professional physical world looking eye candy that sold all of us. 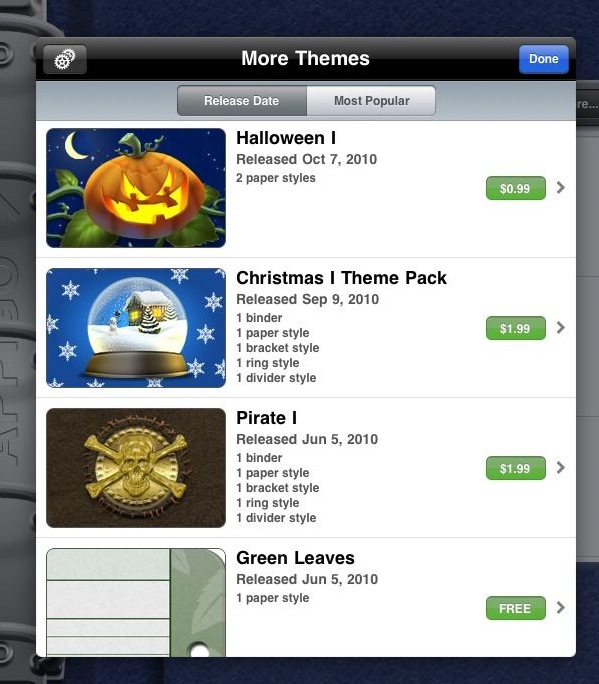 Choosing to see what new themes are available, we see they are holiday centered and can be purchased in-app. Not really our preference since these are office iPads but for the home use it might be fun. A couple shots below you can see that it is pretty easy to switch back and forth between themes so you could switch when doing home chores versus work tasks. If you would rather not know about the new themes to buy, you can choose the Setting button in the ‘More Themes’ screen to turn of the ‘Notify me’ feature. 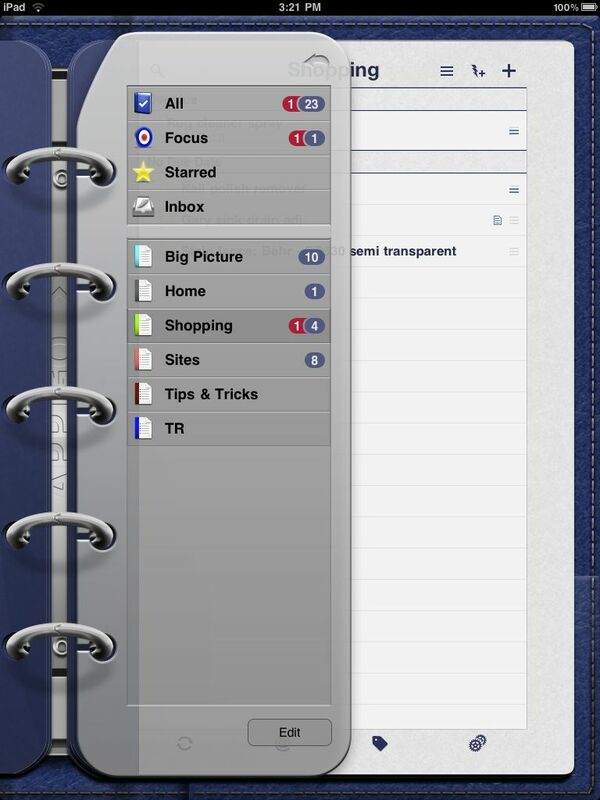 Inside of the back cover of ToDo for iPad is the app’s overall Settings area. If you choose the Theme option you can view and switch between the different themes built in and purchased. An earlier version of Appigo’s ToDo app allowed you to sync to the Cloud task manager service Remember The Milk. 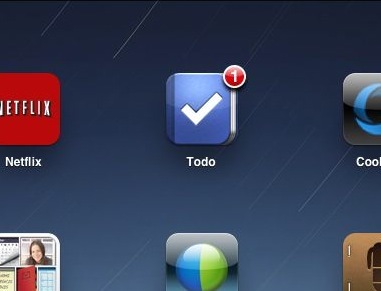 There was a bit of a falling out and that service is no longer supported by ToDo for iPad. Most folks just jumped across to Toodled’s Cloud offering (free for basic service, $15/year US for advanced capabilities). Appigo also offers their Appigo Sync software for free. 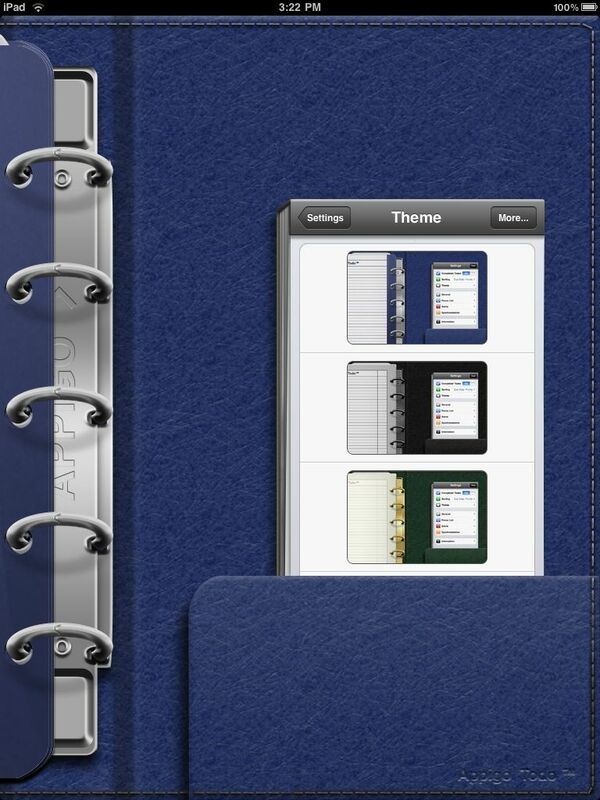 It is free and required to get your iPad ToDo app to sync with iCal. New in version 4 of ToDo is Appigo’s own online Web 2.0 Cloud offering. It runs $19.99/year right now. 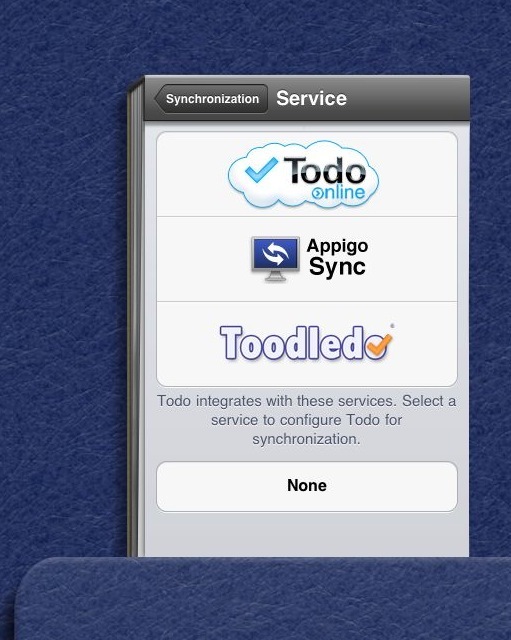 Having this service (available through in-app purchase or online) you are able to sync your ToDo (including multi alerts) lists over WiFi or 3G and access through other mobile devices and your desktop browser.